It’s allergy season again, and those who suffer from severe allergic asthma now have a new option for treatment for severe asthma. Omalizumab is a cutting-edge therapy that offers hope for asthma sufferers who don’t find adequate relief from standard medications. This medical breakthrough is not a medication; it’s a manufactured antibody that inactivates a person’s own allergic IgE antibodies so they can’t cause allergic reactions within the body. IgE antibodies are the bane of asthmatics everywhere; these antibodies react to pets, pollens, and other allergens and cause the allergic and asthma symptoms many of us suffer from every year. Omalizumab binds to our IgE antibodies and renders them inactive so that we don’t suffer allergic and asthmatic symptoms when exposed to what we are allergic to. It is given as an injection every two to four weeks by an Allergy and Asthma specialist and is approved for patients twelves years and older as a treatment for severe asthma. This treatment for severe asthma carries a very small risk of actually causing a severe, life-threatening allergic reaction, so it is only intended for those with moderate to severe asthma who aren’t well controlled on standard medications. Once the asthma is back under control, patients can discuss discontinuing the injected treatments with their doctor to limit the ongoing risk of allergic reaction. 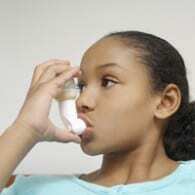 Controlling asthma isn’t only about choosing the right medication. Good eating habits, reducing exposure to allergens, regular exercise as tolerated, and healthy lifestyle choices are all important steps in reducing or eliminating asthma. Natural treatments can also be of significant use for some. Our new Allergy Book in the Sears Parenting Library explores the full range of options available to asthma-suffers and offers personal stories of how Dr. Bob has been able to find healing and resolution of his own allergic asthma. Order your copy today!